The Practical Astronomy Handbooks are a series of astronomy manuals from Cambridge University Press that are designed for amateur and leisure astronomers who use telescopes. Each book in the series emphasizes practical skills: how to observe astronomical objects, how to record observations, and how to get the very best out of equipment. 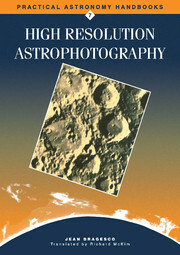 Most books in the series are authored by distinguished amateurs, people who have established a worldwide reputation for their skill in using readily available telescopes to observe the solar system, stars, and the deep universe beyond. This series meets an important need for those amateurs who want to make observations that are among the finest that can be achieved.